When you see red, white and blue in candies like marshmallow cereal bars, they’ve usually been dyed with some kind of food coloring. 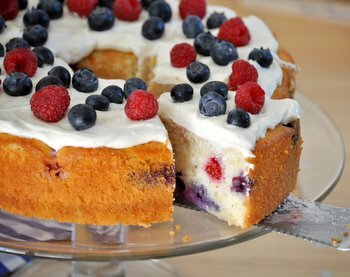 There isn’t anything wrong with using some food coloring to get your desired result – I use it all the time in baked goods when I want a rainbow of colors – but food coloring doesn’t add a lot of flavor to your finished product and it’s nice to get results that are both colorful and flavorful any time you can. 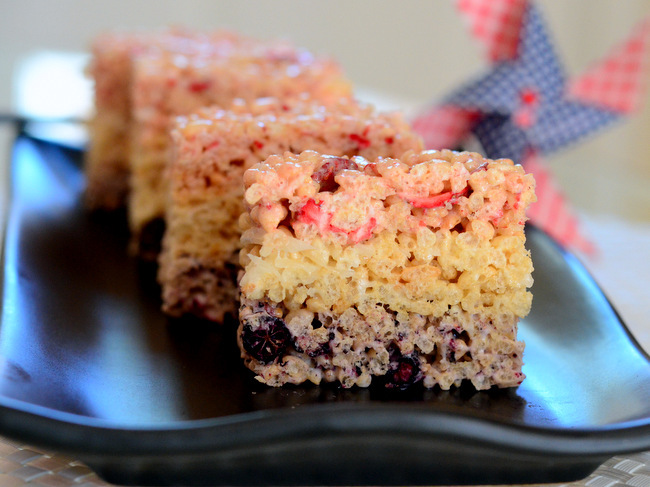 These All Natural Red, White and Blue Rice Krispy Treats are a colorful, food coloring-free snack that is well worth making for holidays like Memorial Day, 4th of July or any other occasion that calls for some red, white and blue! These cereal bars are made in three batches that are layered together, and each has a different color and flavor.Â The “all natural” I’m referring to is the all natural coloring agents I used, which are blueberries and strawberries! You can’t use fresh berries because their juices would compromise the texture of the cereal bars and make them soggy. So instead of using fresh berries, I used freeze dried fruits. These crisp, dry fruits have a lot of berry flavor without any hint of moisture, so they’re very easy to incorporate into a cake batter, cookie dough or a cereal bar base like this one. 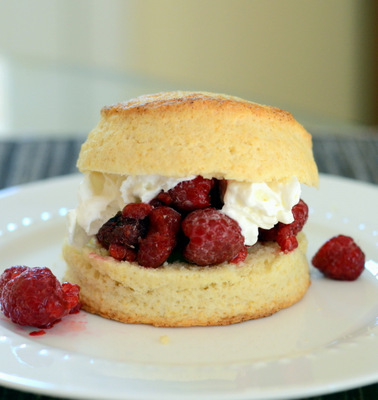 I crushed them up very finely to create a powder that I stirred in to different batches of the marshmallow mix, as well as stirring some of the dried berries in whole. The red layer tastes like strawberries and the blue layer really tastes like blueberries. I didn’t want the white layer (which is an off-white thanks to the cereal) to be left out, so I added shredded coconut and a little vanilla extract to it. Each flavor tastes good on its own, but the bars taste fantastic when you take a big bite and get some of each color. 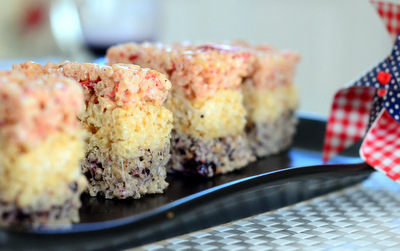 Blueberries, strawberries and coconut work very well together, and they make the cereal bars taste a lot more exciting than the last batch you had! I like to cut these bars into very generous pieces, but you can cut them into bite-sized morsels instead of large bars if you want to scale them down to serve to a big crowd. In a small ziploc bag (or a food processor), crush 1/2 cup of dried blueberries into a fine powder using a rolling pin. Repeat with 1/2 cup of freeze dried strawberries. In a medium-sized, microwave-safe bowl, combine 20 marshmallows and 2 tbsp of butter. Heat for about 60 seconds, until marshmallows have puffed up and butter is melted. Stir in 3 cups of rice krispy cereal, powdered blueberries and remaining 1/2 cup freeze dried blueberries until all ingredients are well-incorporated. Transfer to prepared pan and press firmly into an even layer using a lightly greased spatula. In another medium-sized, microwave-safe bowl, combine 20 marshmallows and 2 tbsp of butter. Heat for about 60 seconds, until marshmallows have puffed up and butter is melted. Stir in 3 cups of rice krispy cereal, shredded coconut and vanilla extract, and stir until all ingredients are well-incorporated. Transfer to prepared pan and press firmly into an even layer on top of the blueberry layer using a lightly greased spatula. In another medium-sized, microwave-safe bowl, combine another 20 marshmallows and 2 tbsp of butter. Heat for about 60 seconds, until marshmallows have puffed up and butter is melted. Stir in 3 cups of rice krispy cereal, powdered strawberries and remaining 1/2 cup freeze dried strawberries until all ingredients are well-incorporated. Pour mixture out on top of the coconut layer and press firmly into an even layer using a lightly greased spatula. Allow bars to set completely, for at least 3 hours, before slicing and serving. Use a sharp knife to cut treats into 18 bars. Store leftover bars in an airtight container.